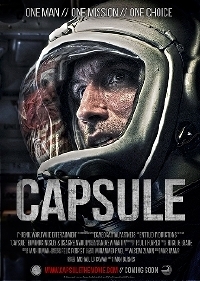 While Capusle is a decidedly indie affair, the premise has me intrigued. *Supposedly* based on true events, I'd be curios to learn if there is any truth to that. Regardless, I live this kind of film. 1959: Guy is an experienced British fighter pilot who is in command of Britain's first manned mission to space. He has trained for this for three years at the height of the Cold War and now he is alone in space, suffering Hypoxia, with a malfunctioning capsule. He has limited contact with the UK, some unusual communication with the US and some unorthodox communication with Tyuratam deep in Soviet Russia. Can he get home? Who will help him? Will he make the right choice? There's no set release date for the film as it's currently making the rounds at AFM, but we'll keep you posted if that changes. I had the chance to see the screener for festival programming and I don't think the trailer does it justice. It is pretty nicely shot and put together but I think the trailer is trying to hide the twist that is revealed at the end and so jumps around the several orbits of earth from the story. Not sure about the true events though!